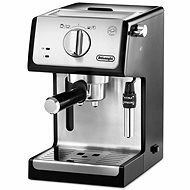 The DeLonghi Scultura ECZ 351.GY is a unique professional espresso machine. Enjoy a cup of coffee with an intense taste, just like in a real Italian café, from the comfort of your living room. Adjust the settings according to your preferences with the help of a well-arranged control panel. With a single press of a button, the coffee maker prepares exclusive espresso or creamy cappuccino for you to savour in just a moment. 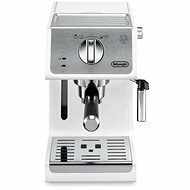 The patented cappuccino system automatically mixes steam, air and milk, producing a rich, creamy froth for great cappuccino. Use the hot water function to make other delicious hot beverages. Choose between ground coffee and Easy Serving Espresso pods (ESE). The integrated cup warmer preheats the cups and keeps your coffee warm longer. With this device, you will save on your energy bills. This modern device has the ECO function with the automatic switch-off after 20 minutes of inactivity, saving both your time and money. This espresso fits you and your needs perfectly. You'll appreciate its exclusive stainless steel design with high-gloss chrome details. Its steel-grey colour will stand out from other appliances in your kitchen. with a steam jet, Cup heater, Drip system, Automatic Shutdown Done! Is it a UK or European plug/power on this machine? Will this work correctly in UK? Are the pods available in UK supermarkets? Can you use tassimo pods? 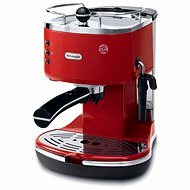 For shipping to other EU countries visit this page De'Longhi Scultura ECZ 351.GY. Für Versand nach Deutschland, besuchen Sie bitte DeLonghi Scultura ECZ 351.GY. Chcete doručit zboží do Česka? Prohlédněte si De'Longhi Scultura ECZ 351.GY. Chcete doručiť tovar na Slovensko? Prezrite si DéLonghi Scultura ECZ 351.GY. Für Versand nach Österreich, besuchen Sie bitte DeLonghi Scultura ECZ 351.GY. Magyarországra történő kiszállításért tekintse meg ezt a termékoldalt: DeLonghi scultura ECZ 351.GY.